Sure, I’m in Paris, but I wasn’t planning to buy perfume. I have plenty already. Besides, I’d already bought a pair of sandals and some underthings, and my budget was shot. Then I smelled Le Galion L’Ame Perdue, a chypre that would have been right at home on Rita Hayworth’s dressing table. When I discovered I couldn’t buy it in the U.S., I handed over my credit card. This baby was going home with me. Perfumer Rodrigo Flores-Roux developed L’Ame Perdue. Its notes include lemon, Sicilian green mandarin, cardamom, coriander seeds, white pepper, datura, Egyptian jasmine, jasmine sambac imperial absolute, Bulgarian rose, ylang ylang, red lily, cloves, cinnamon, plum, mirabelle, patchouli, amber, benzoin, balsam of Peru, rosewood, vanilla, honey and oak moss. L’Ame Perdue is a complex, spicy-fruity chypre with an initial hint of skank and miles of earthy glamour.1 It smelled familiar to me right away — it winks at Rochas Femme and Guy Laroche J’ai Osé — yet different enough to keep me sniffing. Instead of Femme’s dirty plum, L’Ame Perdue serves its fruit up with cinnamon and cardamom on a mossy wood plank with a vanilla bean. Christian Dior Dioressence’s spicy-woody oriental vibe crossed my mind, too, but despite L’Ame Perdue’s heavy hitting notes, it’s more delicate. L’Ame Perdue has moderate sillage and good lasting power. It holds onto its floral-spicy-plum heart for a long time before flattening to a vaguely powdery chypre base. If you’ve lamented that perfume houses just don’t make them like they used to, try a sample of this. Le Galion’s website doesn’t list any retailers in the United States, and a search of the usual suspects doesn’t turn up the brand stateside, either. 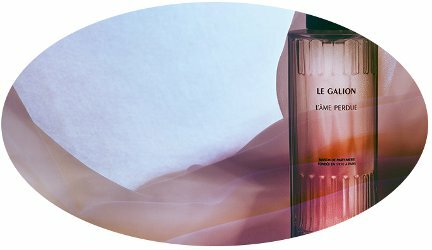 But Le Galion L’Ame Perdue Eau de Parfum is available in European markets for 140 euros for 100 ml (I bought mine at Jovoy). The Le Galion website offers a 10 ml size for 25 euros. There is so much more sillage on the streets here than in the United States. People don’t shy away from spritzing on scent. Too often it doesn’t balance with their style and presence, but sometimes — thinking of a woman of a certain age in a cloud of green chypre — it does. Also, Lancôme La Vie est Belle and its clones are everywhere. Until August 26, the Musée Cernuschi has an exhibition on perfume and culture in ancient China. I went. The show focuses mostly on incense and how it was used in everyday life and across classes. At a few stations, you could smell a recreation of particular old incense forumulas. Dior is one of the exhibition’s underwriters, and for the final scent station François Demachy interpreted a classical Chinese incense for perfuming hair by adding osmanthus, peach, and jasmine — basically turning it into a generic modern fragrance. The museum itself is wonderful, though, and it backs into the Parc Monceau, which is worth a visit on its own. 1. Flores-Roux is also the nose behind Arquiste Ella, another recent fruity chypre lighter and more playful than L’Ame Perdue and definitely worth smelling if you’re a chypre fan. You’re telling me! I was so sure I wasn’t going to buy another bottle of perfume. I make typos all the time! I was craving a chypre, too. Even with the heat, I found myself yearning for a good, fat old-fashioned chypre. L’Ame Perdue is a bit more subtle, but it scratched that itch. Thank you for the review, I’m more keen than ever to try this one. A local perfumery stocked Le Galion for a while, and stopped carrying the line just is time to not get L’Ame Perdue. Bother! Oh no! What a drag. Then you can’t sample it as easily. You lost me at Perdue…after that, all I could smell was chicken ???? Glad to hear that I wasn’t the only person whose mind went in that direction! ???? It never even crossed my mind–of course, now that’s all I’ll think of. Ha ha ha! No chicken in this one. “L’Ame Perdue” means “lost soul” – the name alone could sell me on this scent, even before Angela’s review. Your image doesn’t cross my mind at all! And now I’ll be thinking of factory-farmed chickens as “lost”! I love your story about St Florentin. I visited there once, some 15 years ago or so. It’s only slightly further south from there that the wine growing of Chablis begins, and it is very close to Pontigny Abbey. The fragrance sounds great and I’m more than pleased that they sell very small bottles. All in all you’ve made this very tempting! The friend I visited is dating Chablis’s lead city gardener, so I had the chance to check out the town. Nice! Twisted Lily from NYC stocks Le Galion (and lots of other cool brands and quick shipping! Not affiliated! Just bought lots of samples off them. ) No L’Ame Perdue there yet, though. Sounds wonderful. Thanks for pointing that out! The Le Galion website doesn’t list them as a distributor, and I didn’t check them when I did my random search to see if it was in the U.S. Excellent! I will watch their website with my fingers crossed! ‘Swonderful! ‘Smarvellous! After a caca day, this sounds so damn good. Cheap classics? Figment of the imagination. Lucky coot! I am such a sucker for a good chypre. I only wish it were easier to sample for people in the U.S.
Now I’m lemming this., I was in Burgundy quite a while back, maybe 15 years ago, pre-perfumusta and I probably would not have sought out a perfumery back then anyway. You may be right about the frequent visitor’s intentions! How romantic! I hope I’m right, but I like the story, so I’m sticking to it! Hi Angela. I bought this at Jovoy in July, along with Whip. I’m very impressed by a number of fragrances in the Le Galion line. But L’Ame Purdue was a no-brainer. It was coming home with me no matter what! I didn’t get the chance to try Whip, but now I’m curious! It seems like Le Galion has flown under the radar of lots of U.S. perfumistas. I have a small set of the tiny bottles; I have Whip, 222, Aesthete, La Rose, and Snob. My husband has Special For Gentlemen, Eau Noble and Veryver. (They were supposed to shared). My favorites are 222 and Aesthete. Aesthete is just gorgeous and smokey. 222 is an oriental fougere according to Fragrantica and to me, it has an almost sour component that I love. La Rose is a rose aquatic, which I really do not like at all. I have a full bottle of Snob, which was what I thought of when I suggested this week’s CP. I still like it but I no longer obsessed!! I now want to try L’Ame Perdue! I was at Jovoy in June and they said that they were working on shipping to the US – including samples. The tiny bottles were not terribly expensive but the shipping was crazy. Oh, and we had a sample of Sang Bleu. That was a good one but it veered masculine so my husband took it. Because I could not remember what it smelled like, I just put on Eau Noble and am reminded of the lemon note from Shalimar without the Shalimar. Looks like I will be stealing that one from my husband’s stash! Not that he would notice; he’s as bad as I am. Hey, you’re lucky to share the scent love at home! I noticed that Le Galion is quite a bit less expensive in France than in the U.S. It must be a drag to figure out shipping, and export taxes, and whatever cut a middle-man takes, though. Angela, what shop were you in? I bought the L’Ame Perdue at Jovoy, if that’s the shop you mean. In Saint Florentin, I don’t remember the shop’s name, but it’s on the main drag, just across from the square with the dragon fountain. Your vacay sounds like fun ! I would totally buy the Coriandre from the shop that’t closing down. My mother used to own a bottle when I was a child, it was a gift from friends from Normandie and she loved it. I have Coriandre, or I would have been tempted! Darn it Angela, you’ve just created a huge lemming for me!! (I’m not unhappy about it.????) I hope to smell it at some point in the future. Hopefully, the brand will be around a while, and you’ll have lots of chances to sniff it. You get to far more interesting places in Paris than I do, I think! I had an afternoon off when there on business last month, and ended up on the Left Bank cruising the sales at the kids stores. Leave Bonton, turn left, and…oh, hey, that’s Parfums de Nicolaï! And, oh, hey, Malle! But…my perfume drawer is so well stocked, I didn’t bother going in. (Fashionable kids clothes on sale are a much better investment these days, in my life…I should have gone into Parfums de Nicolaï, though, because I do love her stuff. But…four hours between work and the train.) Anyway — for the next time I get a business trip to Paris, would love to know where you found Le Galion L’Ame Perdue, because it sounds amazing! I found mine at Jovoy, but the Le Galion website lists other places in Paris, too, including a store I’ve always wanted to visit called Marie Antoinette. But did you buy anything in Saint Florentin? Zibeline, at least? I might even have sprung for the Tabac deodorant. My friend bought 15 ml sprays of Zibeline and Secret for one euro each, if you can believe it!